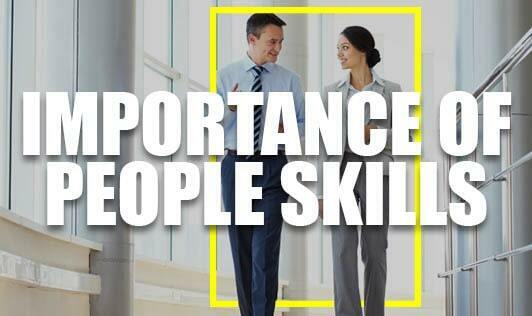 People skills are very important from a young age and these become increasingly essential as an individual gets older. Every aspect of one's life including finding a job, making friends, and having successful relationships depends on the person's ability to get along with others and present a positive image. Here are few strategies that can help you enhance your people skills: • Sharpen your emotional intelligence as it allows you to be aware and in charge of your emotions as well as boosts your confidence. It is important to become aware of your emotions and responses to certain situations and recognize when you or others are stressed. • Resolve conflicts in a positive way, be it at work or at home, a certain amount of conflict is inexorable in any relationship. In times of conflict, focus on the present as well as the positivity of compromising rather than on winning or losing and think about respecting the other person without controlling them. • Take time to listen to others because real communication requires good listening skills. Also, don't interrupt and let the other person speak. Pay attention to not only what the person is saying but also how they are saying it, this is called inflection. • Acknowledge cultural differences wile communicating with someone from a different culture. • Choose your words carefully when you're talking to others. • Have the right attitude. This also includes expecting challenges, keeping things in perspective, having a sense of humor and not taking yourself too seriously at all times. • Pay attention to body language - the non-verbal cues such as good posture, friendly gestures and appropriate eye contact. • Maintain healthy relationships as these help to boost your confidence and make your life more worthwhile. • Refrain from judging and never put others down because people make mistakes and nobody is perfect. • Meet new people, this can broaden your perspective on life as well as improve your emotional intelligence. • Lastly, reflect and improve. It's important to learn from your mistakes and achievements. "The bottom line: Always be respectful of others, even if you think they have nothing to offer you. You may not like the behaviour they display, but that doesn't mean you can't like the individual. By combining these skills with a sincere attitude, you dramatically increase your chances of producing the best possible, win-win outcome. - Nikk Zorbas"